The next major feature update of Windows 10 October 2018 Update, previously codenamed Redstone 5 (RS5), has gone gold with final RTM build of 17763.1. The Windows 10 October 2018 Update upgrades the Windows 10 to OS version 1809. The build was previously released to Windows Insiders in the Fast and Slow rings, and is expected to roll out to general public during the month of October 2018. Microsoft has published the products.xml metadata which is used by Media Creation Tool (MCT). Media Creation Tool is an utility provided by Microsoft to create Windows 10 installation media, ISO image, or simply to upgrade the PC to latest version of Windows 10. 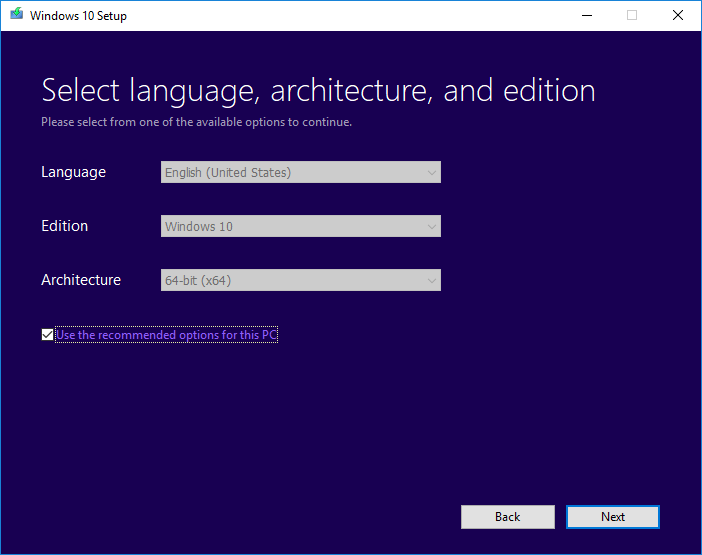 You can also download the Windows 10 Build 17763 v.1809 ISO images directly from Microsoft’s server after conversion from ESD. Or you can use Media Creation. Microsoft has not yet published the Media Creation Tool (MCT) for Windows 10 version 1809. And as Windows 10 October 2018 Update is not officially available yet, the Media Creation Tool is still offering Windows 10 April 2018 Update v.1803 build 17134.1. However, you can use the trick below to force Media Creation Tool, specifically Media Creation Tool version 16299.15 (for Windows 10 Fall Creators Update v.1709) and Media Creation Tool version 17763.1 (for current Windows 10 October 2018 Update), to push Windows 10 October 2018 Update Build 17763.1, hence enabling you to create Windows 10 Build 17763 ISO images or upgrade to Windows 10 October 2018 Update via official Microsoft supported method. Windows 10 October 2018 Update has been released to the general public. You just need to download Media Creation Tool version 10.0.17763.1 to download the new OS straight away. Download Media Creation Tool version 10.0.17763.1 or Media Creation Tool version 10.16299.15 from Microsoft (note that MediaCreationTool1803.exe does not work for the trick as it will ask you to download the latest version with error indicating a newer version of this tool is available and you must download and run the latest version to continue). Download products_2018_10_02.xml published by Microsoft (link expired, download products_2018_10_02.zip and extract the XML file), which contains all download links and other metadata information for MCT to work. After editing, the XML should look like the following at the beginning and the end. Place both MediaCreationTool.exe executable and products.cab in the same folder. Follow the wizard to create bootable Windows 10 October 2018 Update Build 17763 RTM ISO images, USB flash drive or DVD media, which has the build as 17763.1.180914-1434.rs5_release. The workaround is only no longer required as Microsoft has officially released Windows 10 October 2018 Update Media Creation Tool. Once Windows 10 version 1809 is generally available, the MCT should download the latest feature update automatically. Update 2: Windows 10 October 2018 Update has generally available to the public, and is pushed via Windows Update. Windows Update is showing Features Update to Windows 10, version 1809. Update 1: Official Media Creation Tool v.1809 has been published by Microsoft.